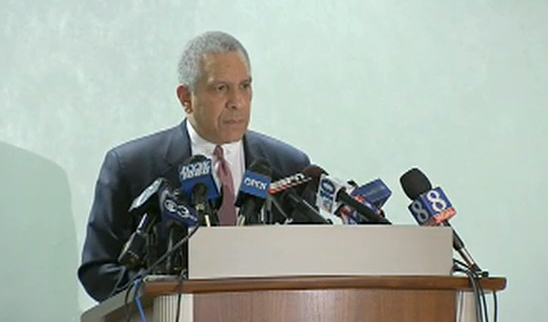 Spanier attorney Tim Lewis, at a news conference in Philadelphia today. Spanier himself didn’t attend the news conference, held in Philadelphia, but he sat down for an interview with ABC News’ Josh Elliott. According to an ABC news release, portions of the interview will appear online on ESPN this afternoon, on World News With Diane Sawyer tonight at 6:30 EDT, and on Good Morning America tomorrow morning. The ABC interview is billed as an exclusive—the first time Spanier has spoken publicly since he lost his job last Nov. 9—but just this afternoon, the New Yorker’s Jeffrey Toobin published lengthy excerpts from an interview that he did with Spanier last month. Lewis also described his own credentials as well as those of the other attorneys on Spanier’s team, pointing out that all of them—like Louis Freeh—are former federal prosecutors. Both Freeh and Lewis also spent time as U.S. district court judges. Freeh was the former FBI director who headed the investigation commissioned by the Penn State Board of Trustees. “I admire Judge Freeh and respect his service to our nation,” Lewis said this morning. But “he has failed here. There is nothing, nothing full or complete about the Freeh report as it applies to Dr. Spanier. Nor am I aware of any court in the land that would accept such unsupported and outrageous conclusions…. Lewis released an 18-page critique of the Freeh report; you can view and/or download that critique here. And for more from the news conference, check out this story from the Pittsburgh Post-Gazette. P.S. The Spanier attorneys also released a letter from former Penn State football player and current faculty member Gary Gray ’72, ’77g, ’84g that they say bolsters their case. The Centre Daily Times has it in PDF form. Entry filed under: Uncategorized. Tags: Jeffrey Toobin, The New Yorker, Tim Lewis. Why did it take a month for this to happen? It would take a month to go through each and every page of the report, once again request documentation and evidence from parties, and draft, revise, edit, etc. a rebuttal. A month is actually a pretty short time – given the gravity of the case and the lack of access they have had to some documents and Spanier’s own records. Freeh was already a household name in some parts of this country. And it wasn’t for anything deserving of pride………..Now some of you in Pennsylvania might understand.